Please Note: As of 2005, I have stopped updating this collecting list. Barbara Gordon continues to be a driving force in Birds of Prey and all issues of that title are recommeded as Essential Reading for all Babs fans. STARRING means just that, too — that Babs is the main focus of the story (the term "CO-STARRING" is used for most Birds of Prey story appearances and a few of Babs' appearances when she is clearly acting in a starring role but is not the only character doing so). Please Note: Appearance lists are organized alphabetically by comic title and then in ascending chronological order by comic publication date. "BoP!" indicates that the story includes an appearance by Babs & Dinah in BoP mode. Essential Reading: I've put a beside all appearances I consider "Essential Reading" for Barbara Gordon fans. If you want to get a good, basic overview of Babs' post-Crisis history, pick up the starred issues. 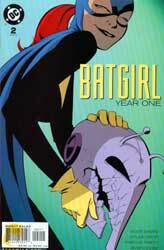 Batgirl: Year One 8, September 2003, “Seasoned Crime-Fighter” — starring �the first proper Batgirl & Robin team-up! Birds of Prey: Batgirl/Catwoman 1, 2003, “” — starring �a wonderful character-driven detective story which includes a quick origin review (which sticks FAR closer to canon than the concurrent Batgirl: Year One) and a highly engaging match-up at its heart. Black Canary/Batgirl: Birds of Prey 1, February 1998, “Birds of Prey” — starring � BoP!